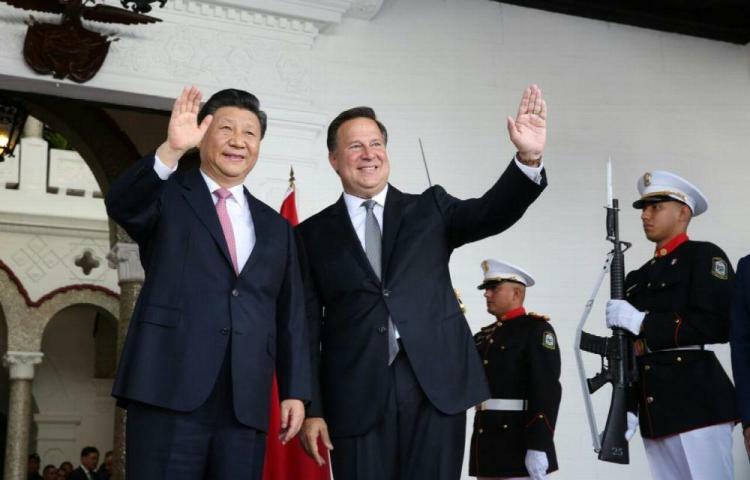 Chinese President Xi Jinping, and the president of Panama, Juan Carlos Varela, signed 28 agreements on Monday, December 3 with which they seek to face the challenges of protectionism and promote the liberation of trade in Latin America with Panama as a regional commercial hub. Among the agreements signed are protocols that will allow Panama producers to export fruits meat and sea products, to China, these instruments will promote the growth of these productive sectors', in addition to the educational cooperation agreement that ensures scholarships for higher education for Panamanians in China, and Chinese in Panama. Varela, in his speech, said he would soon know the progress in the feasibility study of the construction of a train that will reach Chiriquí "which is being developed with cooperation funds from the Chinese government." He rejected interference from third countries in the relationship between China and Panama, "We are a small country, but worthy and sovereign and our relations will continue to be strengthened and well managed with transparency. I am sure that our relations will not only bring benefits to our people but to our region and the world, guaranteeing greater connectivity. President Xi said that his country is willing to work with Panama to promote cooperation in the areas of trade, tourism, infrastructure, finance, and cultures to bring greater benefits to both peoples. An understanding between the National Bank and the Development Bank of China, laying the basis for cooperation in the granting of financial services to business projects. Multiple entry visas for ordinary passport holders. They are stamped visas of multiple entries, which will have a duration of stay that does not exceed 90 days, valid for 5 years. Agreement that seeks to promote cooperation in science, technology, and innovation, establish a strategic framework through the execution of joint projects for the strengthening of systems in these fields. Cultural cooperation agreement that promotes collaboration between both countries in art, industries, and cultural heritage, through assistance and collaboration between their artistic groups, museums, libraries. In environmental matters, with which they will implement projects, research for the prevention and management of air pollution, water, waste and the development of policies and environmental management, education, awareness, mitigation in the face of climate change. PANAMA | The Failed Era of Bush in Central America The U.S. mourns for former U.S. President George W. Bush. George W. Bush apprehended General dictator Manuel Noriega. Manuel Noriega was apprehended at the cost of thousand of Panamanian lives. Panama was struck by a U.S. all night raid of 500 pound bombs. Panama was a fiery inferno with civilians shot in the dead of night. The U.S. caused fiery inferno while Panama celebrated Christmas. The U.S. Congress house divided provokes war to facilitate target. The U.S. former president apprehended Manuel Noriega but George W. Bush wanted the credit of the U.S. power and might. The U.S. military generals laughed at the decimation and destruction. The world was quiet and the United Nations condemns the U.S. Panama had to pick up the pieces with the U.S. installed Panama presidency. Panama has formal political diplomatic relationship with China. Panama has numerous signed agreements with China. Panama / China desire to build a fourth set of locks. The U.S. Panamax canals is entirely inefficient at a waste of 200% of water dumped into the oceans for each ship transit. The U.S. Panamax canals is entirely at risk of destruction from Panama's frequent surrounding earthquakes. Panama is entirely at risk of losing vast water consumption due to a non earthquake resistant dam and U.S. Panamax canals. The United States wants a close relationship with Panama and offers nothing but military security and another invasion? ------------------------------------------------------------------------------------ The U.S. / Panama Agreements: 1. The U.S. promises never to kill thousands of Panamanians over one man...(a good start). 2. The U.S. promises never to have an informant U.S. trained agent such as the deceased General Manuel Noriega under their wing. 3. The U.S. promises never to initiate a war with Panama through the quick process of provocation to avoid Congress approval. 4. The U.S. promises never to follow tradition of presidential war mongers starting with Panama...(very difficult, Panama at risk). 5. The U.S. promises never to initiate war with China using Panama as their battle ground. 6. The U.S. promises never to make an example of Panama to the community of nations. 7. The U.S. promises never to use their latest high tech weapons arsenals against Panama in the event of another one day war. 8. The U.S. promises to commemorate the U.S. 1989 invasion of Panama in Panama soil between the two nations. 9. The United States promises to replace the Panamax canals with financing and earthquake resistant designs to combat the poor inefficient use of 200% water displacement disposals. 10. The United States promises to work in collaboration with [Panama as the project world leader] in the construction of a two complex systems of water saving basins of larger locks. The United States must recognize the urgent need to the replacement of the Panamax canals or face the inevitable consequences of the Chinese sphere of influence with Panama and the dire national security risk of a stricken earthquake vulnerable U.S. made Panamax canals. PANAMA | Panama's Real Estate Ready For a Sell-Out? Panama's corporations are mainly from foreign nations. Foreign corporate nations in Panama are brand name central trade established. China wants brand name central trade establishment. Panama corporations could lose its growth to any company buy out to China. China corporations may manufacture quality cheap products at lower costs. China corporations may control the Panama work-force. China will take the profits and use it to buy-out Panama real estate. China will restructure Panama infrastructure to appear to benefit Panama. China will take control of the tourism industry and hotel industry. China will support their favorite presidential candidates...corruption? China has fine food restaurants and hospitality. China will buy out Panama corporations and real estate. What about the 26 fair agreements? What agreements? Panama must know the Chinese language... …………………..$$$ CAPITAL CONTROL $$$...…………………. Panama President Varela does not see any further than his...(cash on hand?) or that wonderful construction work of... high speed trains...fourth bridge. Basically...China has foot in the door. The United States Pompeo warned of possible concessions...(continue) In other words... Selling out Panama to China.